Chief Minister Parkash Singh Badal today urged Union Agriculture Minister Sharad Pawar to help Punjab in promoting farm diversification and demanded a grant of Rs 5,000 crore for the purpose in the 12th Five- Year Plan. Members of the joint action committee formed to seek "justice" for Shruti Sachdeva today showed black flags to local Member of Parliament Paramjit Kaur Gulshan and blocked her way while she was heading to a school to inaugurate an event. Deputy Chief Minister Sukhbir Singh Badal today asked Punjab Director General of Police Sumedh Singh Saini and Inspector General (NRI affairs) Gurpreet Deo to launch a campaign against illegal travel agents duping innocent youth, especially in the Doaba belt. The Bahujan Samaj Party (BSP) will field its candidates on all seats in the state during the next Lok Sabha elections, said state BSP president Parkash Singh Jandali while talking to mediapersons here this evening. The Union Personnel Ministry has directed the Principal Accountant-General (Accounts), Punjab, to stop the salary of West Bengal-cadre 993 batch IAS officer, KJS Cheema, posted as Special Principal Secretary to Chief Minister Parkash Singh Badal, besides initiating disciplinary action against him. Punjab Mandi Board chairman Ajmer Singh Lakhowal today said foreign direct investment (FDI) was the need of the hour and he wondered why Chief Minister Parkash Singh Badal and Deputy CM Sukhbir Badal were opposed to it. Dr JS Chopra has resigned as chairman of the doctors' selection committee after the Health Department did not accept his recommendations. Irked at the selection list being tampered with and the papers carrying his signatures “trashed”, Dr Chopra has put in his papers. Health Minister Madan Mohan Mittal has said the civil surgeons will monitor the activities of all government doctors in their respective districts. Mittal, who was in the city today to inaugurate a newly constructed neonatal care unit at Government Mata Kaushalya Hospital, said he would not tolerate any lapse in this regard. The civil surgeons would be held accountable in case they failed to check this practice, he said. The Punjab Public Service Commission (PPSC) will install 120 CCTV cameras to monitor the proceedings during the Punjab Civil Services (PCS) examination schedule for November 25. The aim is to ensure complete transparency in the examination process. The commission has also hired around 550 mobile jammers for the purpose. Overhauling the democratic process at the grassroots level, the Punjab Government has decided that sarpanches would be directly elected by villagers instead of the earlier practice of being nominated by elected members of the panchayat. The parents of 19-year-old Ashia, who had gone missing from Mandi Gobindgarh on October 1, have alleged the local police had failed to bring back their daughter even having information about her whereabouts. US-based Monsanto has offered to provide high yielding hybrid maize varieties suited to Punjab to help the state diversify crops. The stray cattle menace is proving to be a major hindrance in smooth flow of rail traffic across the district with passengers having little option but to wait for hours together to board trains. Red-tapism has once again come in the way of the proposed six-storeyed Rs 35 crore District Administrative Complex (DAC) with the project design, prepared by the Chief Architect's office, hitting a roadblock. The Patiala police range has been working without a Deputy Inspector General (DIG) ever since the transfer of the earlier incumbent last month. The Danga Peerat Welfare Society today moved the Punjab and Haryana High Court alleging that the Punjab Government was not following policies for the rehabilitation of the 1984 anti-Sikh riot victims. In a significant judgment, the Punjab and Haryana High Court has made it clear to banks that they can only recover the pending amount and not enrich themselves by purchasing properties of defaulters. Taking suo motu cognizance of a letter written by Punjab’s former Health Minister and senior BJP leader Laxmi Kanta Chawla for the rehabilitation of rag-pickers, the Punjab and Haryana High Court today issued a notice to the State of Punjab. Pleading Punjab’s case before a delegation of experts from various fields, including agriculture, animal husbandry, dairy and fisheries, led by Sharad Pawar, the Chief Minister emphasised that the Centre must ensure procurement of alternate crops, especially maize, through the Food Corporation of India by fixing a minimum support price. Only then, said Badal, could Punjab break the wheat-paddy cycle. He reiterated that the livestock sector could play a major role in improving the income of landless farmers in rural areas. However, for this purpose, it was essential to bring funding, interest on loans as well as income tax exemptions on par with agriculture. Demanding a slew of incentives to promote dairying in a big way, Badal said the Centre should grant exemption from custom duty for import of machinery relating to dairy, poultry, feed and fodder, besides additional allocation under various Dairy Development schemes. Badal demanded that small ruminants such as goatry and piggery be included under National Mission on Protein Supplement besides setting up of an ICAR unit for research in fisheries and prawns in the state. Responding to the demands raised by the Chief Minister, Pawar gave in-principle consent for launching a technology mission to promote crop diversification in the region. To strengthen the research for development of maize, the ICAR would set up a state-of-the-art institute over a land area of 100 hectares to be provided by the state. To encourage the adoption of fisheries in saline and waterlogged areas, Pawar announced setting up five ultra- modern demonstration centres -- one each at Mansa, Bathinda, Muktsar, Faridkot and Ferozepur districts. Chandigarh: The Punjab Government has urged the Centre to cut interest rate on agriculture credit by NABARD by 2 per cent to give boost to the sector. The agricultural sector can only be strengthened by ensuring long and short-term credit to farmers on low interest rates, said Finance Minister Parminder Singh Dhindsa while addressing a two-day National Conference of Agricultural and Rural Development Banks here on Tuesday. The conference is being organised to explore possibilities to strengthen the cooperative movement in the country. The minister said agri banks were unable to extend credit to farmers at lower rates as they themselves got investment credit from NABARD on high rates. 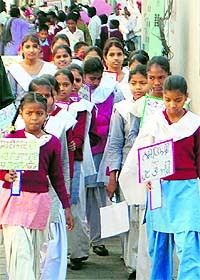 Gulshan was about to reach the local Government Girls Senior Secondary School to flag off an anti-drug rally when a large number of committee members arrived there and started raising slogans against her. She was accompanied by the local legislator Deep Malhotra. The protesters assembled at the school entrance gate and blocked the Gulshan's way. It was only after a lot of persuasion by the civil administration and police officials that the protesters lifted their blockade and allowed the MP to flag off the rally. While showing black flags to the MP, the protesters accused her of supporting the culprits in the Shruti case. A minor, Shruti was allegedly kidnapped by Nishan Singh, whose mother is a councillor. The girl is at present lodged at a nari niketan in Jalandhar and her parents have approached the court in pursuit of her custody. The joint action committee members have been opposing the visit by any leader of the ruling SAD-BJP combine to Faridkot town in view of their alleged biased role in the kidnapping case. At a meeting of the NRI Department held here today, NRI Affairs Minister Bikram Singh Majithia raised the issue of the rising number of cases of illegal travel agents duping the youth of Punjab and sending them abroad without any valid work permit. The Deputy Chief Minister said it was the responsibility of law enforcing authorities to ensure that no agent without any licence from appropriate authority and clearance from protector of immigrants should be allowed to operate. He asked the authorities to keep an eye on those agents who were issuing advertisements in vernacular newspapers without giving their complete address and launch a drive against them. Sukhbir asked the Home Department to present 'Human Trafficking Act' in this ensuing session of Vidhan Sabha to give teeth to the law enforcement authorities against illegal agents. He has sought a weekly report from every district SSP regarding the campaign and asked Deo to monitor this campaign so that challans against them could be filed in the court on time. Jandali said development projects in the state had come to a standstill due to a ban on mining activities. He said the state government had failed to provide jobs to the youth and the industrialists were being forced to shift their units to neighboring states in the absence of a facourable industrial policy. Jandali called upon the people to unite against the policies of both the Congress and Shiromani Akali Dal (SAD). He said both these parties had failed to show concern for the poor people. Others present were Bhim Singh Manki, Parkash Bharti, AN Singh, Naresh Kumar, Amarjit Singh, and Harbhajan Singh. Sources in the Department of Personnel and Training (DOPT) has written to the AG (Accounts) office here to immediately stop Cheema's salary for overstaying in Punjab and disobeying orders to report back on duty in his parent cadre. Officials in the AG (Accounts) office, confirming the development, said they had no power to stop Cheema's salary. They explained that the AG (Accounts) office used to release the salary of IAS officers earlier. Now, the power to draw and disburse salary was with various departmental heads. An official said the AG's office would send the letter to the state government for necessary action. Sources said the DOPT had requested the state government to repatriate Cheema to his parent cadre on numerous occasions. They said Chief Minister Parkash Singh Badal had in return requested that he be allowed to retain the officer as he was needed in his office. Three months back the DOPT had reportedly written to the West Bengal Government, asking as to what disciplinary action had been initiated against Cheema for his "unauthorised deputation" to Punjab. Badal last wrote to the DOPT in May this year, saying he wanted to retain Cheema. He, however, did not get a favourable response to his request. According to state government sources, Cheema came on deputation to the Punjab Government in 2007 when the SAD-BJP government came to power. According to DOPT guidelines, such deputations should not exceed three years and permission may be given for a five-year deputation only once in the officer's career. The guidelines also state that officers overstaying for any reason whatsoever are liable to face disciplinary action and other consequences, including the period of unauthorised overstay not being counted for pension. The Principal Secretary, Personnel, Anirudh Tewari, when questioned on the issue, said the state had not received any letter from the DOPT recently on the issue of Cheema's overstay. Cheema himself was not available for comment. Addressing mediapersons on the first day of the international conference on "Wholesale Markets: Global Opportunities and Innovations" organised by the Punjab State Agricultural Marketing Board here, Lakowal said, "We cannot sit with our eyes shut to the changes across the globe. There was a lot of opposition to Bt cotton initially. Think from a farmer's perspective whose yield will jump more than five times." A similar change has come in the form of lesser debated Bt maize, he said. "In the same light, let us, at least, give a chance to FDI," he said. 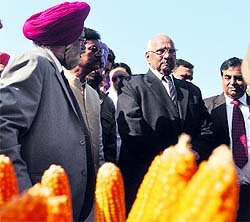 Lakhowal said the Bhartiya Kisan Union had already lent its approval to the FDI. "So, how can I differ". Addressing the conference earlier, the Chief Minister called for the need to adopt world's best practices of wholesale market management for the marketing of fruits and vegetables in the state to ensure remunerative returns to the farmers, especially the small and marginal ones. The Chief Minister said that the cooperative system was the best option to facilitate inter-state marketing of fruits and vegetables from Punjab in about 50 major cities across the country having big markets, with each city having a population of over one million. Dr JS Chopra has resigned as chairman of the doctors' selection committee after the Health Department did not accept his recommendations. Irked at the selection list being tampered with and the papers carrying his signatures “trashed”, Dr Chopra has put in his papers. The Secretary, Health and Family Welfare, Vini Mahajan, said: “ Dr Chopra had insisted on the selection of a doctor, currently serving with Baba Farid University, who was rejected by the selection committee." Dr KK Talwar, a former director of the PGIMER, has been offered the post following the acceptance of Dr Chopra’s resignation by the Governor. said he had not faced any interference in the past four years.The trouble began when two more IAS officers were made members of the selection committee during the last meeting, he alleged. Dr Chopra said the doctor concerned had been selected only on the basis of an interview. "I had noted on his file that he be given an appointment letter only after verification of his past record. This was to be fair to the candidate”. He said the Vice Chancellor of Baba Farid University had not mentioned anything in writing against the doctor's behaviour. Health Minister Madan Mohan Mittal has said the civil surgeons will monitor the activities of all government doctors in their respective districts. Mittal, who was in the city today to inaugurate a newly constructed neonatal care unit at Government Mata Kaushalya Hospital, said he would not tolerate any lapse in this regard. The civil surgeons would be held accountable in case they failed to check this practice, he said. The Health Minister said it was the primary duty of all civil surgeons to ensure that this practice was discouraged. If a government doctor was found indulging in private practice, the matter should be reported to the Chandigarh office so that action could be initiated against the erring doctors, he said. Urging the people to cooperate with the department in exposing such cases, Mittal said they should inform the civil surgeon or senior functionaries concerned. Mittal said five government hospitals of the state would be upgraded at a cost of Rs 69 crore. "The department will initiate a special survey from December 1 on the rising cancer cases so as to assess the exact situation throughout the state. This survey will be completed in a month," he added. PPSC Chairman Lt Gen RS Sujlana (retd) said 119 examination centres had been set up in Chandigarh. "The question paper will have four sets. The PPSC had received 45,790 applications, Of these, 43,606 candidates were found eligible," he said. He said around 70 vehicles had been hired to transport the examination material, including question papers, on time. "Police personnel will thoroughly scan the candidates. Women constables will be deployed for girl candidates," Sujlana added. Speaking on the issue here today, Rural Development and Panchayats Minister Surjit Singh Rakhra said besides direct elections of the village head, elected panches would no longer have the power to remove a sarpanch from the post through a no-confidence motion. “Only the Rural Development and Panchayat Department director will have the power to remove any sarpanch in case there are serious charges against him,” said Rakhra after presiding over a high-level meeting of deputy commissioners and district development panchayat officers here. The development would make the posts of sarpanch more authoritative and stable in gram panchayats. Earlier, elected panches used to elect a sarpanch by voting system and remove him by bringing in a no-confidence motion. “In a way, the powers of panches have been curtailed,” an official said. Rakhra said demarcation of wards for panchayat, block samiti and zila parishad elections, to be held before May 31 and May 15 next year, respectively, would be done afresh in villages having population of more than 300. “Officials concerned have been directed to complete the demarcation of wards before January 31,” the Minister said. He said it was for the first time that panchayat elections were being held through wards in the state. Now, deputy commissioners would be responsible for redressal of objections related to ‘wardbandi’, he added. Girl's mother Nazma, a resident of Sangatpura village, said even as the police had traced her daughter to Meerut, it had failed to bring her back. She said she did not believe in police version according to which Ashia had got married to a boy in Delhi. The parents had lodged a complaint on October 19. A case was registered on October 28 after villagers held a protest against the police inaction. Station House Officer Chand Singh said the girl had eloped with a Meerut-based boy. He said the girl had told the police that she was happily married and was living in Delhi. She told the police that the boy was working in a private transport company and they would present their marriage certificate to the police soon, he added. She also told the police that they feared threat to their life, the SHO said, adding the police had raided the boy's house in Meerut, but the two were not present there. “His brother was present at the home. We had warned the family members to produce their son along with the girl before the police,” the SHO added. A Monsanto team, which visited the city today to talk to policy-makers as well as agriculture experts, said the company had developed heat tolerant hybrid maize varieties for the Northern region. Monsanto India Region CEO D Narain and Gyanendra Shukla, Director, Branded Business and Corporate Affairs, said the company had concentrated on developing maize varieties for the kharif season so that these could become a viable alternative to paddy. Shukla said the company was working on a system approach to optimise maize and wheat yields and that its maize varieties had been successfully tested in the region. They said Monsanto was collaborating with Punjab Agricultural University, Ludhiana, which had also assessed its maize varieties. "According to our research, our hybrid maize varieties are capable of giving yields between 50 and 70 quintals per hectare which competes with paddy yields over a similar area," Shukla said. He said the company was looking at shorter duration maize varieties which would enable farmers to grow a third crop if needed and increase their earning. Meanwhile, Consuelo E Madere, who was also part of the team and is Vice-President, Global Vegetables and Asia Commercial, said the company was keen to team up with farmers in Punjab, Haryana and Himachal Pradesh for cultivation of high yielding vegetables under protective conditions. Madere said net house cultivation had increased in all three states and that Monsanto had come up with high yielding varieties which had been successfully tested in the region. Most of the night trains are often seen running behind schedule because of the menace. Ironically, the administration seems to be waiting for a major mishap before swinging into action. The records of train arrival timings procured by The Tribune show that the last passenger train of the day, 74984, which runs from Fazilka to Kotkapura through Muktsar, has been able to reach the local railway station on its scheduled time (9:07 pm) only once thus far this month. As a result, passengers who have to board Punjab Mail from Kotkapura railway station to go to Delhi often miss it. Last Wednesday, three animals were killed after getting crushed under the wheels of a moving train near Malout. Three days ago, an engine sent from Muktsar to Bariwala covered the distance of 20 minutes in an hour as several animals had blocked the track. Muktsar station master CL Meena said, “Drivers of night trains are having a tough in dealing with stray animals.” He, however, blamed the public for the menace saying throwing garbage near the tracks was the cause of the problem. The Chief Architect's (CA) office wanted that the District Transport Office (DTO) , which attracts a lot of rush, should be located on the fifth floor while the less busy District Election Office be given space on the first floor. But district officials have objected to this as they want the DTO's office on the first floor. The SSP's office, which has been given space on the ground floor, has no washroom. Deputy Commissioner Abhinav Trikha said the design has been sent back to the Chief Architect's office with the necessary recommendations. He said that work on the project would commence once the "incongruities in the design" were removed. The foundation stone of the complex was laid by former Chief Minister Capt Amarinder Singh on May 17, 2006. Earlier, the proposed complex was also to house judicial chambers. But the Building Committee of the Punjab and Haryana High Court ruled that a new judicial complex be built at the existing site. Sources said matters relating to police transfers, crime meetings and public grievances were pending due to the vacancy. "We have a complaint pending in Sangrur. Despite repeated attempts, the police has not registered an FIR on our complaint. With no DIG posted in Patiala, there is none who can listen to our grievance," a Sangrur resident said. The earlier Patiala DIG, LK Yadav, was transferred to the CM security last month. The government has so far failed to find a replacement. The Patiala DIG office covers police districts of Patiala, Sangrur and Barnala. Besides hearing the grievances of the people from these districts, the DIG looks after inter-district police transfers. "Even the routine work of these districts is now being looked after the Patiala zone IG who already has many other administrative works", said a senior officer. "It is learnt some more police transfers are on the cards," he stated. Meanwhile, residents of Rajpura and Ghanaur sub-divisions have been facing inconvenience following the failure of the state police to depute a DSP-level officer there for the past some time. The work of these subdivisions which include six police stations and many police posts is being looked after by the Superintendent of Police (SP), who operates from Rajpura. The complainants have no option but to approach either the Rajpura SP or the Patiala Senior Superintendent of Police. The society claimed that the respondents, especially the Ludhiana Deputy Commissioner, were not complying with the policies for allotment of flats to the victims. Taking up the petition, a Division Bench of the High Court put the State of Punjab and other respondents on notice for February 4 next year. Elaborating, counsel for the petitioner Mansur Ali said the society was praying for directions to the Deputy Commissioner not to harass the riot victims to furnish proof of their identity, when all they had were red cards issued by the State of Punjab. He said the Deputy Commissioner was rather restricting the allotment of flats in Ludhiana to riot victims living there, whereas riot victims with red cards settled anywhere in Punjab could apply. Mansur Ali said the Deputy Commissioner was "even putting the names of illegal occupants of flats in the draw of lots, despite the fact that their respective flats are only required to be regularised by giving formal allotment letters. A draw of lots could be held only for vacant flats, which were about 900 in number in Ludhiana," Mansur Ali said. Giving details, Mansur Ali said in 2008, the State of Punjab formulated a policy, whereby unauthorised possession of houses by the riot victims was to be regularised. "As per the policies, the illegal possession by the riot victims is required to be regularised. As such, the Deputy Commissioner is to simply give the allotment letters. “The names of the said occupants/riot victims, who are in illegal possession, cannot be put into any draw of lots as they are already living in their respective flats." The petition quoted the Deputy Commissioner as saying that the draw of lots was to be held by November 30. The ruling came as a Division Bench of the HC passed strictures against The Ropar Central Cooperative Bank and imposed costs of Rs 20,000 on it. The bank had sought a review of an order passed by the High Court on September 20, whereby the auction of property belonging to one Shamsher Singh was set aside. Working as a secretary with a society, Shamsher Singh was charged for embezzlement of funds. In pursuance of the arbitrator’s award, his land was attached and put under the hammer. The bank was the successful auction-purchaser. But the auction was set aside. Taking up the matter, a Division Bench of Justice Hemant Gupta and Justice Rajiv Narain Raina asserted: “The interest of the bank is only to recover the embezzled amount and not to enrich itself by purchasing property, which the bank is bound to re-sale for release of its dues. “The procedure adopted by the bank and resistance to the order for setting aside of the auction, speaks volumes of the conduct of the bank as it appears that the bank is more interested in the property rather than the amount directed to be paid by the legal representatives of the deceased Shamsher Singh”. Dismissing the petition, the Bench added: “We do not find any merit in the present review application… The application is dismissed with costs of Rs 20,000. 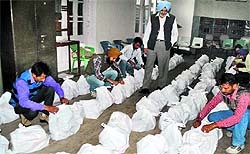 The amount of is to be deposited with the Punjab State Legal Services Authority within a month." The suo motu cognizance by a Division Bench of Chief Justice AK Sikri and Justice RK Jain came on Chawla’s letter addressed to the Chief Justice. In her letter, Chawla claimed that despite the Prevention of Beggars Act: 1971, a large number of children and women could be seen begging on city roads. Alleging lack of measures to prevent the children from begging, she feared that they could turn to crime if not rehabilitated or taken care of by the state. She claimed that the issue was raised by her before the authorities concerned. But nobody was apparently serious on the issue. Chawla said only judiciary could issue specific directions to the state government to take steps for the education and rehabilitation of such children.